Fashion is an ever-changing thing. It produces art that continues to push boundaries and make things new. This spring, Scout and Molly’s Boutique at Quarry Village are putting out brand new items for the season that are sure to bring out new pops of color and patterns that make your spring season all the brighter and more fun! 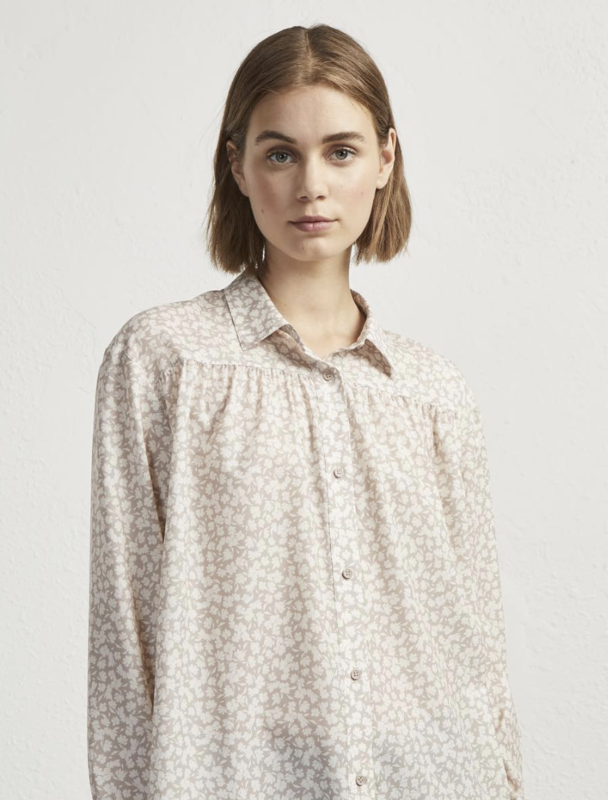 This French Connection light blouse is a perfect blouse for spring that can be casually styled or dressed up for a nice dinner out. The blouse is a very light gray color with white accents and features a button-down front with a collar at the top. It’s a long-sleeved shirt, so it’s perfect for those spring days that are still on the cool side, but since it is a light material, it doesn’t get too hot as the day warms up. This button-up shirt is perfect for a casual day out and can easily transition for a night out for a nice dinner. This shirt is a soft white color that sits at the waist. It is a button-up shirt but the cut only comes up so far so that when it is buttoned it has a v-neck cut. The shirt has playful ruffles that run alongside the buttons and around the entire collar. It’s a sleeveless blouse that hits at the shoulder and the ends of the sleeves also have a soft, elegant ruffle to it. A perfect option for jeans or a skirt! This casual spring dress is a perfect soft white color. It’s a short-sleeve dress and has a short collar. The front of the dress is pleated and it buttons down to the knee. There is a nice ribbon that ties around the waist to accentuate the curves. The dress goes a little past the knees and is casual enough to wear with sandals, but dressy enough to look adorable with a nice pair of pumps. There is enough detail to the dress that jewelry is not necessary, but it’s simple enough that it can be easily fancied up with a couple of statement pieces! All three of these options are a perfect combination for any closet while this spring fashion season is ushered back in. They are simple but fresh and will keep you looking fabulous this spring season. You can look at Scout and Molly’s Boutique of Quarry Village and find these options and many more that will not only make you look your best but will have you feeling you best as well!